The day we read the heart-rending story about a four-year old boy in Ntinda who was crushed to death by a wayward lorry this week even as we were recovering from the horrific recount of the teenage kidnappings, I found a man beating up a little boy at the Kitante crossing. For a few seconds I was confused, because the fellow dishing out the violence was the zebra crossing attendant outside Kitante Primary School, and the child was a uniformed pupil making his way across the road. The child had ran irresponsibly across half the road and the attendant had frantically restrained him from going the other half where the lunch hour traffic was uncontrollably zipping past. The adrenalin and his relief at having saved the boy’s life combined to trigger off a volley of angry slaps into the face of the little fellow. The boy had been in the wrong and certainly deserved sanction or punishment – but not THAT beating; so I wound my window down and lambasted the zebra crossing attendant, who was startled into halting his attack. My own adrenalin or whatever other substance causes angry excitement, had risen at the sight of this fellow unleashing adult violence upon a little boy and memories of our own childhood when we got beaten up by similar adults not for reasons of discipline, but to release their own frustrations of life under most repressive circumstances. 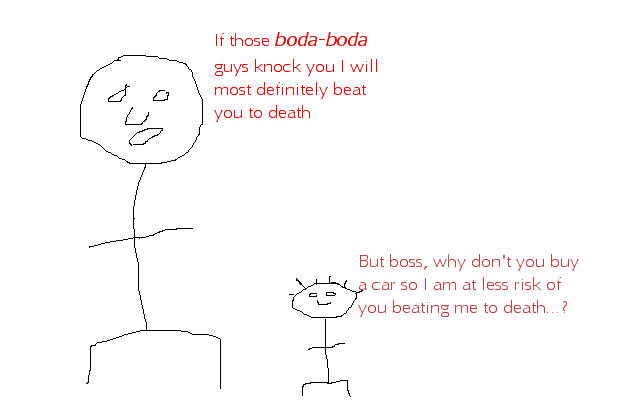 I also felt it was not sensible for him to be threatening the child with further violence, yet was still confused because he believed he was doing it for the boy’s own good. And then I remembered the little boy of Ntinda. A neighbour who had seen the accident happen recounted it to us tearfully, complete with details of how the little boy’s minders had jumped to safety on seeing the truck hurtling their way, leaving him in its path. His mother, poor lady, had left them just minutes before to return to her domestic duties. Once again, examples of children being so unfairly treated by adults who should know better but actually DON’T seem to know better. I run this small private NGO inside my head whose objective is to stop adults in Kampala from exposing their children to danger as they walk around the city. I noticed this many years ago and began a crusade that I hope is helpful but also returns hilarious results. Our (so far I am the only employee) task is one: whenever we see an adult walking with a child and that child is on the open side of the road, we tell the adult to place the child on the shielded side, and to hold the child’s hand firmly. We don’t have sidewalks or pavements in most parts of the city, and the majority of us don’t own or operate motor vehicles, so you would be surprised how many lives are mindlessly put at risk in this manner every day. The adults in question cannot be blamed because it never occurs to them to: a) hold the hand of a child when walking down the road or b) place the child out of harm’s way, on the side that doesn’t have cars being operated by cranky irrational Kampala drivers. Most of us were probably raised in an environment lacking the danger of motor vehicles, so the peril posed by traffic and city roads is not present in our sub conscience. But even people with university degrees, who work in so-called ‘big’ companies where there are terms such as ‘Environmental, Health & Safety’ will be found driving their questionable Japanese cars with children unstrapped in the front seats. So if a lawyer, auditor, banker, doctor can drive around with their child not wearing a seat belt in the vehicle’s most dangerous seat, while talking on a mobile phone, why would any lower-cadre parent with a humble education think of holding their child’s hand as they walk down a busy road engaged in kaboozi with a fellow housegirl/courier/tea-woman? That’s why a zebra crossing attendant, while saving your child from being run down by a speeding car, can unknowingly cause him brain damage from a few angrily struck blows. This is about rubbish. Literally about rubbish, no political satire or irreverent dribble. 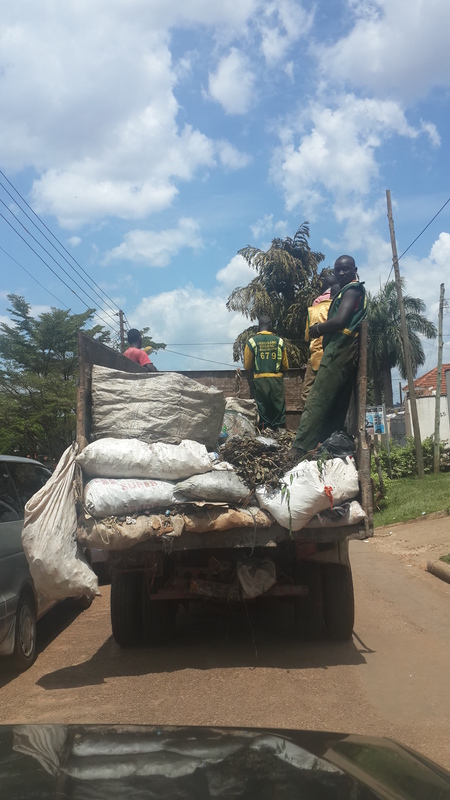 I have spent a total of thirty minutes behind garbage trucks in Kampala this week. I have complained, talked, written and prayed about this before, and whereas I am not giving up soon I am beginning to accept certain smelly, unhygienic facts about the lives we lead. The most significant trip I made behind an open-ended garbage truck took place on Tuesday afternoon, following one managed by ‘Nabugabo Updeal Joint Venture’. This extravagantly-named outfit has a website – www.nabugaboupdeal.com – that says they are the “Best Waste Management Service Provider in Uganda”. And THAT is what almost made me give up on the idea that we will be one day rid of all this smelly rubbish. The four chaps on the back of the truck were standing right in the garbage and hopping off occasionally to collect bags of garbage that belonged to them. In between stops, they were engaged in such jolly banter that I almost envied them, as I was alone in my vehicle and conversation-less. Outside my office, I finally stopped having to follow them but as I was reverse-parking into my spot I was horrified to see one of the fellows jump off the truck, walk straight up to the courier/messenger/tea-fellow of my neighbour’s office, and SHAKE HIS HAND! He didn’t just give him five or ‘bonga’ – he SHOOK HIS HAND! I almost lost control of my vehicle as my mind exploded with visions of germs transferring from garbage man to courier/messenger/tea-fellow and from there to wherever he had been sent to deliver envelopes or a flask of tea. Petrified, I observed them in conversation so long that it ended and the garbage truck left with its diseased contents, allowing me to recover my wits enough to summon the courier/messenger/tea-fellow. Dropping my window (I always keep them up and the air conditioning on because of the high propensity for being behind a garbage truck), I made as if to shake the courier/messenger/tea-fellow’s hand and…he OFFERED IT TO ME!!!! (Take a pause to go and relieve yourself. There are many ways to ward off nausea, but take a walk and get some fresh air). Startled at my vehement withdrawal, he confessed to not having even thought about his pal’s occupation even though the man was clad in really filthy green overalls and had literally jumped out of a pile of garbage to say hi to him. And, of course, he had not noticed how black his friend’s hands were! “Put that phone into your pocket immediately and go and wash your hands!” I instructed, a little frantically, and as luck would have it the phone rang as if on cue…and he was raising it to his face when I screamed at him not to. Gloves cost about Ushs2,000 a pair – and my house has been re-stocked. www.nabugaboupdeal.com carries photographs of employees at work and none of them ever has gloves on their hands. I don’t know what that means – it’s a rubbish statement. Pretending to take the garbage away while dropping bits of it in the road and sticking it to our hands, envelopes and tea flasks. International Women’s Day had us saying farewell to a grand old lady who lived 102 years and left behind a humble yet powerful legacy as a good mother, devoted wife, committed Christian and one of the most hardworking people in her community. One story that stuck about the industrious nature of Tezira Rwabuhungu went back to her time as a young girl in Rwanda, where they used to go out in groups to do communal digging. Because she had a tendency of literally digging from dawn till dusk, people started avoiding her and her group diminished in numbers but she went on tilling the soil. One day, a eulogist recounted, she complained that nightfall had come too quickly yet she had been tilling non-stop from early that morning! Another told us how she made the determination after getting married and acknowledging the humble nature of the salary of her Reverand husband, that her family would never want for anything. This made her work doubly hard at making handicrafts to increase their domestic income – which she did well into her eighties! 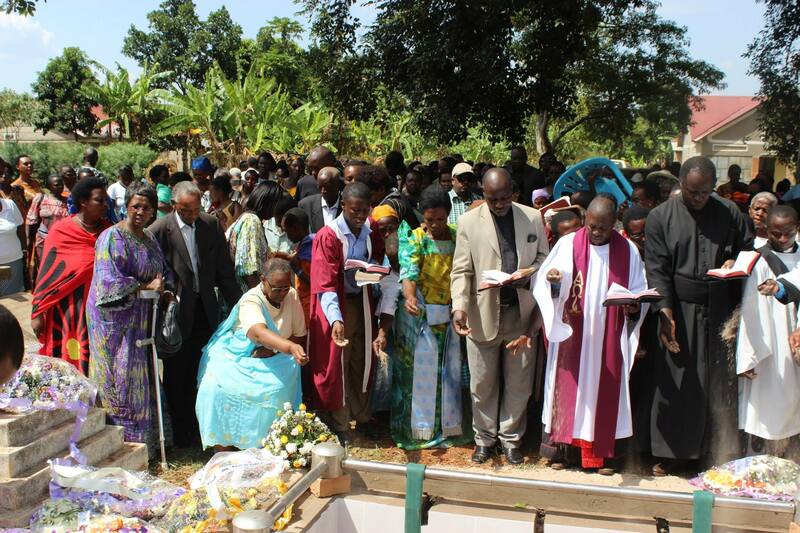 Her final journey took us to Namutamba, in Mityana, where right at church I met her anti-theses – all three of them men, of varying education levels but similarly humble beginnings. The first had a kiosk selling fruit right across from the church we were at, which caught my attention because of a recent dietary shift on my part. His prices were half what I meet in Kampala, so I was eager to stock up for the week, but he wasn’t ready to suffer the inconvenience of searching for change. 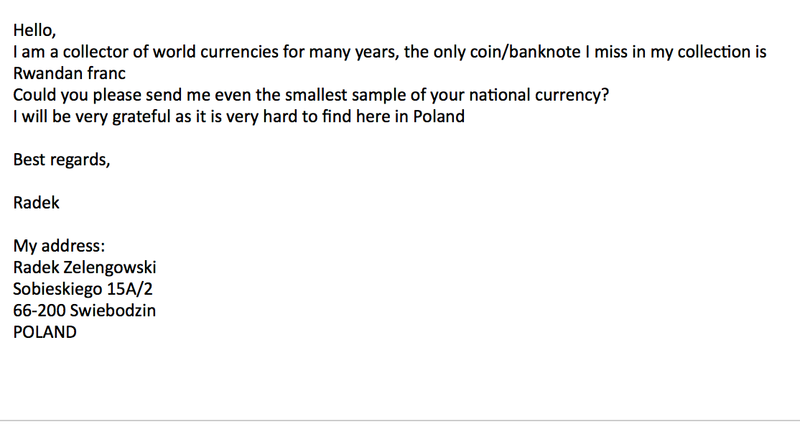 After a few minutes of bargaining with him to take more of my money, I realised how ridiculous I sounded and stepped back. But the pull of the fruit was strong, and I felt a duty to change his attitude as well. So I invited him to cross the road with me to explain that if he created a branch of his kiosk using a table set up in the compound of the church just metres away, he would make enough money for change to not be a problem, since there were hundreds of people from Kampala present. He gave me that, “I’ll get back to you” look, walked back to his banana-laden kiosk, and only returned when I sent for him much later on as I was engaged in a one-sided conversation with the second antithesis, a chap called Something Sebuturo. Sebuturo burst in on a conversation I was having with Capt. Gad Gasatura about Namutamba’s vast potential for tourism since it contains a wealth of history right in the homes of the people there. Just as we were warming up our theme to package it for the newly-formed Uganda Tourism Board team, Sebuturo arrived, preceded by thick fumes of alcohol. Before long we were in stitches as he engaged us in witty Kinyarwanda mixed with Luganda and some Runyoro, and he was so busy chatting he missed out on the bananas being distributed. That’s when I sent for the Kiosk entrepreneur, and the third antithesis to the hard working old lady entered the picture. His breath gave off no alcohol, so I paid him a little more attention and was surprised at the eloquence of his conversation, which included some english words. “I did Cambridge exams, you know!” he said at one point, referring to the question papers sent to Uganda by post from Canterbury between the 1960s and 1980s. All this he did while swinging the kaveera of litter, even as he revealed that his father had been a well-respected carpenter in the area. This was shortly before Sebuturo walked off haughtily after announcing to me, “Alright, I am off – Ushs500 is all I need right now!” and throwing me a disdainful gesture after I dilly-dallied at providing him with said funds. 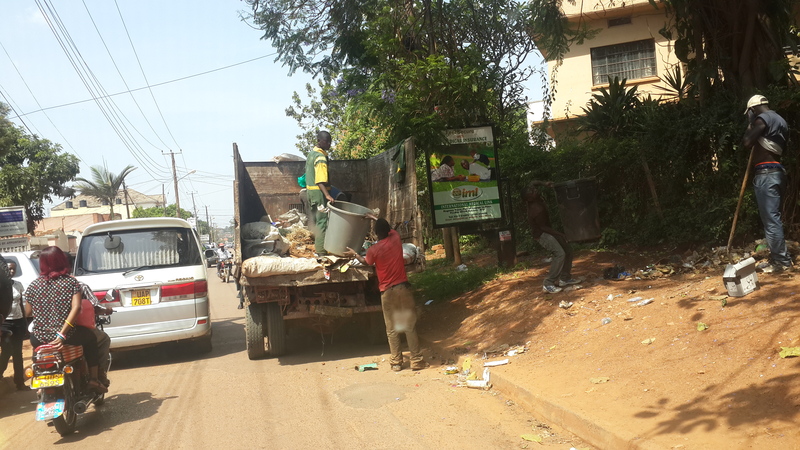 What had happened to Magango to make a random kaveera such a valuable possession that he would gather up our rubbish? At least Sebuturo’s breath was a pointer to his general disposition, even though he did strike a funny pose standing in the foreground of his brother’s four wheel drive vehicle driving off back to Kampala. And most of all, I couldn’t understand why was the kiosk seller was NOT selling off all his wares at the funeral of a woman whose work ethic, industry and dedication to service was legendary, at least as a gesture to say: May her soul Rest In Peace.